Eagle scores another touchdown! Another satisfied customer! It is that time of year to put away your prized possessions for the winter. We at Eagle are very happy to oblige your request with one of our storage lifts (MS-8000 storage lift and MS-8000XLT storage lift). We love to hear back from our customers when their expectation have been meet or exceeded such as the case with Gary in Milan, Illinois. 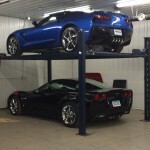 Thank you Gary for taking the time to send us a picture of your lift in action, with your prized 2014 Limited Edition Stingray. Customer satisfaction is our priority and we love to hear back from our loyal customers. 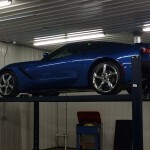 Posted on January 15, 2014 January 18, 2019 Author eagleequipCategories Lifts, Storage Car Lifts, TestimonialsTags 2014 stingray, 4-post auto lift, eagle storage lift, GLO-8000 storage lift, GLO-8000XLT storage lift, Limited Edition Stingray, Service Lift, with your prized 2014 Limited Edition Stingray. Previous Previous post: What the heck is Compliance & Where Do I Get a Certified Lift?